PROJECT TEAM: Stanford University (lead); Farasis Energy, Inc.
Multifunctional batteries have been an area of interest for over a decade with some limited success in the small unmanned aerial vehicle (UAV), WASP, funded by the Defense Advanced Research Projects Agency (DARPA). Developments in tangential fields present great opportunities to advance multifunctional batteries; however, incorporating advances from other fields requires breaking disciplinary barriers. Advanced computation capabilities have improved mechanical models for multifunctional batteries, which opens up opportunities for optimizing load-bearing structures. Second, improved sensing technologies, such as actuating and sensing ultrasonic transducers, can now be leveraged to determine the health and residual monetary value of partially spent batteries. These abilities could further reduce battery costs. Under its RANGE award, a team from Stanford University united with Farasis Energy, Inc to bring advanced mechanical modeling and sensing expertise to battery design and production. The Stanford team developed a multifunctional structural battery with integrated sensors that assist with real-time assessment of the state of charge (SoC) and state of health (SoH). The team explored various configurations for adding the load-bearing capability without sacrificing energy storage performance. As a mechanism for adding structural strength, they developed Multifunctional Energy Storage Composites (MESCs), seamlessly embedding Lithium-ion battery materials into high-strength carbon-fiber composites or automotive-grade aluminum. The MESCs employ polymer rivets to lock the electrodes and current collectors in place. The rivet structures prevent the typical shear movement of the electrode stack, akin to stabilizing a loose deck of cards. The rivets improve the load transfer between the cell layers and enable the constituent layers to contribute to the battery’s structural and mechanical load-bearing performance. Key design parameters were optimized through electrochemical-mechanical experiments and computational modeling. Standard industry electrodes can be adapted to function in this design, which is critical to industry adoption. 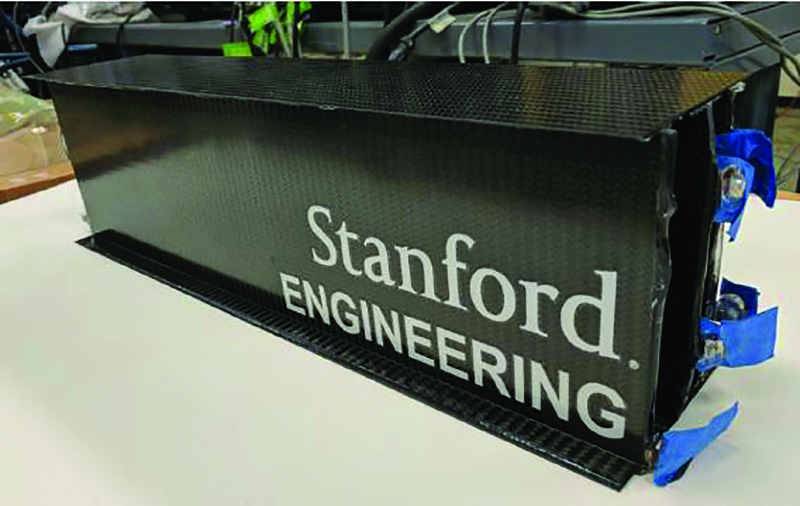 To further reduce cost, the Stanford team applied advanced, non-destructive material testing techniques to battery sensing, resulting in an integrated system that assesses SoC/SoH continuously in real time. This monitoring system is based on a network of actuators and sensors that measure strain, temperature, and ultrasonic guided-waves. Stanford’s discovery of the correlation between waveform signal parameters and battery SoC/SoH made this technique possible. This technology could be applied not only to multifunctional batteries, but also to conventional batteries. This technique also works for pure structural systems. A similar sensor technology, also developed by the team, is being implemented in purely mechanical (not multifunctional) structures today. The Stanford team has successfully built and tested prototypes of these multifunctional battery I-beams (Figure 1). The beams’ mechanical tests show that significant load (no fewer than 1,500 lbs.) does not alter electrical performance. Ultimately, the team expects to be able to achieve an energy density of ~180 Wh/kg, comparable to leading available EV batteries. Compared to commercially available packs with protective plates, the multifunctional battery could achieve up to 30% overall weight savings, which will translate to substantial reduction in fuel consumption. Companies from various industries, including automotive, aeronautical, and aerospace, are interested in seeing this technology further developed. Airbus, RUAG, Ford, BMW, and Linamar are among the most enthusiastic about the structural battery technology. For aeronautical and aerospace manufacturers, this multifunctional battery could serve as a wing for drone aircraft, or as a chassis for a satellite, whereas automanufacturers could integrate these batteries into the vehicle frame for future EVs. Because satellites and unmanned air vehicles are high value, niche markets that are not very cost sensitive, they are likely first markets for the batteries. The Stanford team has translated to practice multifunctional batteries that synergistically carry mechanical loads and store electrical power, thus minimizing EV weight and enabling paradigm-shifting design concepts. The advances that Stanford has developed with cost-competitive manufacturing, weight savings, and battery design offer a significant, innovative approach to meeting the cost and performance requirements for the widespread adoption of EVs. Although the long-term impact of these multifunctional batteries outside the automotive industry is difficult to predict, the spill-over effect is promising in the broader economy. As of December 2017, the Stanford team’s project has generated two invention disclosures to ARPA-E, and two U.S. Patent and Trademark Office (PTO) patent applications have been filed on the disclosed inventions. Thomas, J.P. & Qidwai, M.A., “The Design and Application of Multifunctional Structure-Battery Materials Systems,” JOM 57(3) (2005) 18-24. Joost, W., “Reducing Vehicle Weight and Improving U.S. Energy Efficiency Using Integrated Computational Materials Engineering,” JOM, 64(9) (2012) 1032-1038.